Don’t let Bram Stoker’s story frighten you. 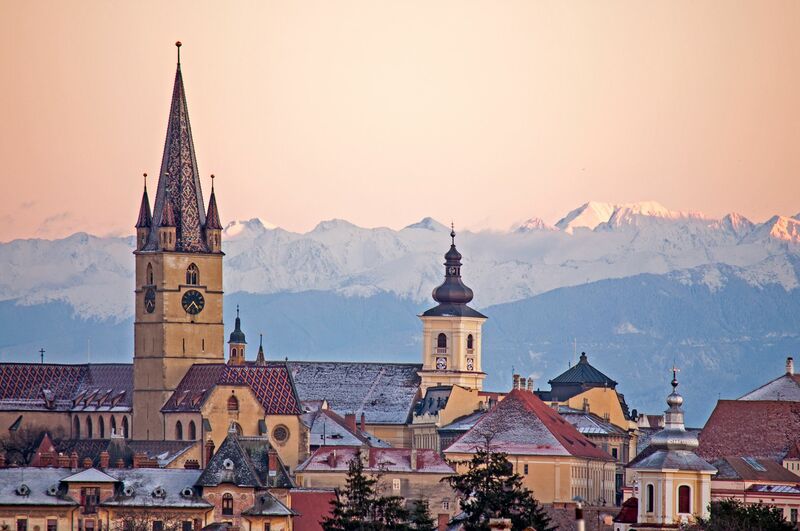 Sibiu may be a city located in Transylvania, but it was ranked by Forbes as the 8th most idyllic place to live in Europe. Its historic center was registered as a UNESCO World Heritage Site in 2004. Additionally, the city sits below the picturesque Făgăraş Mountains. Not even the undead would leave that. Nothing special, city center is a large place, it is ok for a evening walk. Sibiu is one of the big cities in Transylvania. The old town is really beautiful, especially in winter when it's covered with snow. Two days would be a good enough time to see all the attractions but it would be good to stay longer and enjoy beautiful Transylvanian city. Sibiu is a fantastic small city and one of the seven original fortresses of Saxon Transylvania. It's a lively town with a handsome old city with some historic attractions and museums. realy beautiful and good renovatet City, of course lots of other tourists but the old City is a must if you are there. a Little bit ca. 15 KM in the east is a campground, Near the Center are a lot of parkinglots not expensive. A UNESCO World Heritage site for its restored center, Sibiu is a charming place to experience Transylvania - just don't expect to find any vampires. 1292 - The first hospital in the Kingdom of Hungary was attested. 1380 - The first documented school in the Kingdom of Hungary. 1494 - The first pharmacy in the Kingdom of Hungary. 1534 - The first paper mill in the Kingdom of Hungary. 1544 - The first book in the Romanian language was printed in Sibiu, funded by John II Sigismund Zápolya. This was in Cyrillic letters. 1551 - Conrad Haas's experiment with rockets. 1570 - The Ottoman-dependent Principality of Transylvania was formed after the Ottoman conquest in Hungary. 1671 - Methane gas was discovered near Sibiu. 1782 - Franz-Joseph Müller von Reichenstein discovered the chemical element tellurium. 1788 - First theatre in Transylvania. 1795 - The first lightning rod in Transylvania and in Southeastern Europe was installed in Nagydisznód (present-day Cisnădie). 1817 - The Brukenthal Museum, the first museum in Transylvania was opened. 1896 - The first use of electricity in Austria-Hungary, and the first power line in Southeastern Europe. 1904 - The second city in Europe to use an electric-powered trolley (after Timisoara - Romania). 1918 - Upon the Union of Transylvania with Romania, Sibiu became part of Romania. 1928 - The first zoo in Romania. 1989 - The third city to take part in the Romanian Revolution. 2011 - The 17.5 km of motorway forming a partial beltway around Sibiu was fully completed on August 30. Sibiu is a wonderful place in Transylvania. It reminds me a lot of Brasov with its medieval center. It was the European Culture Capital in 2007 and was named by Forbes one of the top idyllic places to live in ! It can be reached by car, bus, train or plane. Very affordable city, interesting mostly for culture lovers. Die Rumänien Reise mit Bastian Brunner (Allerheiligen-Allerseelen 2011) war eine der gelungensten und spannensten Reisen die ich je gemacht habe. Mit Zelt und Schlafsack bewaffnet bei teilweise minus Grade, ein ziemliches Abenteuer. Abseits campen, in der früh ein Feuer machen. Kennen wir eh alles schon. Was neu war, war einfach der Ort an dem wir uns befanden. Transilvanien ist ein verzauberter Ort, sei es im Hinterland von Bran oder auch viel östlicher im Hügelland des Rumänischen Salzburgs. Alleine schon wegen der Transfargarschen Hochstraße würde ich fort nochmal hinfahren.